This really funky wall clock has a convex lens shaped face with matching coloured hands. Its main feature is the moving clock face, which gently swings to and fro as a pendulum, the chunky hands stay stationary providing a point of focus. 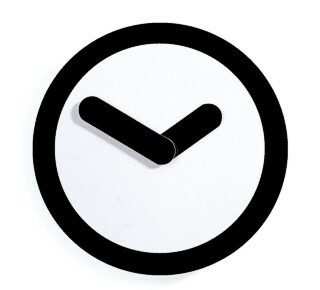 This minimalist clock, is a real discussion point and is suitable for most aspects. It is made from opaque polymer, is 25cm in diameter (10 inches approximately) and arrives in a Stallinga box.